Scientists have developed a new device that can rapidly screen the blood in just minutes to detect a range of pathogens that cause disease, in a breakthrough that could fast-track the way disease or infection is diagnosed and treated. From a sample of blood, or other body fluids, it has the potential to diagnose serious diseases within an hour, including bacterial or fungal infection, HIV, hepatitis and diabetes. It can also create a full blood profile giving the overall health status of a patient simultaneously. The technology is a small spectrometer that uses infrared light to analyse disease-causing pathogens in the blood. Each pathogen has a unique chemical fingerprint and it's from this fingerprint a diagnosis can be done. The portable device weighs about seven kilograms and is powered by a small battery. Monash University biospectroscopists have been issued a US patent for the diagnostic technology they hope will one day help doctors to diagnose and treat patients much faster than current pathology methods. A US patent was issued for the technology last year for its ability to detect malaria, but the multi-disease diagnostic has since been expanded with this second patent to detect all pathogens in blood. The patents, which have been licensed to Biotech Resources (Aust) Pty. Ltd. (BTR), are the first of a kind to utilise spectroscopy to quantify pathogens in blood. BTR will commercialise the product. The diagnostic technique is the brainchild of co-inventors Dr Philip Heraud, Professor Bayden Wood and Dr David Perez-Guaita, of the Monash University Centre for Biospectroscopy in Melbourne, Australia. 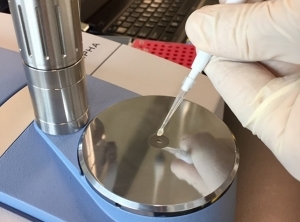 The team is currently trialling patients in the detection of bacterial and fungal pathogens in the blood that cause the deadly bacterial infection sepsis. “This technology represents a paradigm shift for disease diagnostics and has such been recognised with patent rights,” Professor Wood said. The next step is to commercialise and refine the technology. Researchers hope the device could be approved for used in hospitals and field settings in the next three to four years.